Eugene Merle Shoemaker (April 28, 1928 – July 18, 1997), also known as Gene Shoemaker, was an American geologist and one of the founders of the field of planetary science. He is best known for co-discovering the Comet Shoemaker–Levy 9 with his wife Carolyn S. Shoemaker and David H. Levy. This comet hit Jupiter in July 1994: the impact was televised around the world. Shoemaker was also well known for his studies of terrestrial craters, such as Barringer Meteor Crater in Arizona. Shoemaker was also the first director of the United States Geological Survey's Astrogeology Research Program. Shoemaker was born in Los Angeles, California, the son of Muriel May (née Scott), a teacher, and George Estel Shoemaker, who worked in farming, business, teaching, and motion pictures. His parents were natives of Nebraska. During Gene's childhood they moved between Los Angeles, New York City, Buffalo, New York and Wyoming, as George worked on a variety of jobs. 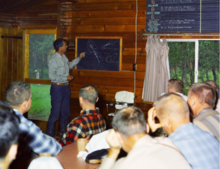 George hated living in big cities, and was quite satisfied to take a job as director of education for a Civilian Conservation Corps (CCC) camp in Wyoming. His wife soon found life in a remote cabin quite unsatisfactory. [a] They compromised, when Muriel got a teaching job in Buffalo. She could teach in the Buffalo School of Practice of the State Teachers College at Buffalo during the school year while keeping Gene with her, then both would return to Wyoming during the summers. Gene's passion for studying rocks was ignited by the science education courses offered by the Buffalo Museum of Education. [b] He enrolled in the School of Practice in the fourth grade, and began collecting samples of minerals. Within a year, he was also taking high-school-level evening courses. The family moved back to Los Angeles in 1942, where Gene enrolled in Fairfax High School at the age of thirteen. He completed high school in three years. During that time he also played violin in the school orchestra, excelled in gymnastics, and got a summer job as an apprentice lapidary. Gene enrolled in the Caltech in 1944, at the age of sixteen. [c] His classmates were older, more mature and on a fast track to graduate before serving in World War II. Gene thrived in the fast pace and earned his bachelor's degree in 1948, at age nineteen. He immediately undertook the study of Precambrian metamorphic rocks in northern New Mexico, earning his M. Sc. degree from Caltech in 1949. While Shoemaker was attending Caltech, his roommate was Richard Spellman, a young man from Chico, California. Although Shoemaker had already enrolled in a doctoral program at Princeton University, Gene returned to California, to serve as best man at Richard's wedding in 1950. He met Richard's sister, Carolyn, for the first time on that occasion. Carolyn had been born in Gallup, New Mexico in 1929, but the Spellman family had moved to Chico soon afterward. Carolyn had earned degrees from Chico State College in history and political science. She had never exhibited any interest in scientific subjects while growing up, and had taken one geology course in college, which she had found quite boring. Nevertheless, the couple formed a "pen pal" relationship while Gene spent the next year in Princeton, followed by a two-week vacation touring the Colorado Plateau. She reportedly told others that,"listening to Gene explaining geology made what she had thought was a boring subject into an exciting and interesting pursuit of knowledge." The couple married on August 17, 1951. The Shoemakers had three children: two daughters and one son. Carolyn saw her work as keeping house and raising the children especially after they settled in Flagstaff in the 1960s. She had tried teaching school before they married, but found the work unsatisfying. She also traveled sometimes with Gene, but stopped after she noticed that her absence affected the children. After their children were grown, Carolyn wanted something meaningful to combat the "empty nest" feeling. By then, Gene Shoemaker suggested that she take up astronomy and join his team looking for asteroids approaching Earth. A student working at Lowell Observatory commenced teaching her astronomy. She showed great potential and launched her career as a planetary astronomer at age 51. She continues the work to the present. 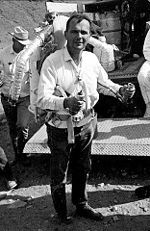 Eugene Shoemaker wearing a Bell Rocket Belt while training astronauts. The United States Geological Survey (USGS) hired Shoemaker in 1950. [d] His first assignment was to search for uranium deposits in Utah and Colorado. His next mission was to study volcanic processes, since other investigators had already noticed that uranium deposits were often located in the vents of ancient volcanoes. This study led him to explore the Hopi Buttes of Northern Arizona, which happened to be near Meteor Crater. Daniel Barringer, an entrepreneur and mining engineer who had discovered Meteor Crater in 1891, had postulated that it had been caused by the impact of a meteor. About the same time, G. K. Gilbert, the chief geologist of the USGS, examined the crater and announced that it had been created by an explosive venting of volcanic steam. A majority of scientists accepted Gilbert's explanation of the cause of the crater, This theory remained as conventional wisdom until Shoemaker's investigations a half century later. For his Ph.D. degree at Princeton (1960), under the guidance of Harry Hammond Hess, Shoemaker studied the impact dynamics of Barringer Meteor Crater. Shoemaker noted Meteor Crater had the same form and structure as two explosion craters created from atomic bomb tests at the Nevada Test Site, notably Jangle U in 1951 and Teapot Ess in 1955. In 1960, Edward C. T. Chao and Shoemaker identified shocked quartz (coesite) at Meteor Crater, proving the crater was formed from an impact generating extremely high temperatures and pressures. They followed this discovery with the identification of coesite within suevite at Nördlinger Ries, proving its impact origin. Shoemaker was also involved in the training of the American astronauts. He himself was a possible candidate for an Apollo Moon flight and was set to be the first geologist to walk on the Moon but was disqualified due to being diagnosed with Addison's disease, a disorder of the adrenal gland. Shoemaker would train astronauts during field trips to Meteor Crater and Sunset Crater near Flagstaff. He was a CBS News television commentator on the early Apollo missions, especially the Apollo 8 and Apollo 11 missions, appearing with Walter Cronkite during live coverage of those flights. He was awarded the John Price Wetherill Medal from the Franklin Institute in 1965. Coming to Caltech in 1969, he started a systematic search for Earth orbit-crossing asteroids, which resulted in the discovery of several families of such asteroids, including the Apollo asteroids. Shoemaker advanced the idea that sudden geologic changes can arise from asteroid strikes and that asteroid strikes are common over geologic time periods. Previously, astroblemes were thought to be remnants of extinct volcanoes — even on the Moon. In 1993, he co-discovered Comet Shoemaker–Levy 9 using the 18-inch Schmidt camera at Palomar Observatory. This comet was unique in that it provided the first opportunity to observe the planetary impact of a comet. Shoemaker–Levy 9 collided with Jupiter in July 1994. The resulting impact caused a massive "scar" on the face of Jupiter. Shoemaker spent much of his later years searching for and finding several previously unnoticed or undiscovered impact craters around the world. Shoemaker died on July 18, 1997 during one such expedition in a head-on car collision on the remote Tanami Track, a few hundred kilometers northwest of Alice Springs, Australia. Shoemaker's wife Carolyn was severely injured in the crash. On July 31, 1999, some of his ashes were carried to the Moon by the Lunar Prospector space probe in a capsule designed by Carolyn Porco. He is the only person whose ashes have been buried on any celestial body outside Earth. The fatal crash had happened when Hale-Bopp was still visible to the naked eye, having passed perihelion and having moved into the southern celestial hemisphere. Doctorate of Science, Arizona State College, Flagstaff, 1965. Wetherill Medal of the Franklin Institute, co-recipient with E.C.T. Chao, 1965. Arthur S. Flemming Award, 1966. Doctorate of Science, Temple University, 1967. NASA Medal for Scientific Achievement, 1967. U.S. Department of the Interior Honor Award for Meritorious Service, 1973. Member, U.S. National Academy of Sciences, 1980. U.S. Department of the Interior Distinguished Service Award, 1980. Arthur L. Day Medal of the Geological Society of America, 1982. G.K. Gilbert Award of the Geological Society of America, 1983. Rieser Kulturpreis, co-recipient with E.C.T. Chao and Richard Dehm, 1983. Honorary Doctorate of Science, University of Arizona, 1984. Barringer Award of the Meteoritical Society, 1984. Kuiper Prize of the American Astronomical Society, Division for Planetary Sciences, 1984. Leonard Medal of the Meteoritical Society, 1985. Distinguished Alumni Award of the California Institute of Technology, 1986. Rittenhouse Medal of the Rittenhouse Astronomical Society, co-recipient with C.S. Shoemaker, 1988. U.S. National Medal of Science, 1992. Whipple Award, American Geophysical Union, 1993. Fellow, American Academy of Arts and Sciences, 1993. AIAA Space Science Award, 1996. NASA Exceptional Scientific Achievement Medal, 1996. Bowie Medal, American Geophysical Union, 1996. Special Award, American Association of Petroleum Geologists, 1997. Shoemaker Award, Texas Section of the American Institute of Professional Geologists, awarded posthumously, 1997. A ring-like topographic feature in Western Australia, an astrobleme previously named the "Teague ring" was renamed "Shoemaker Crater" in honor of Eugene M. Shoemaker. The Near Earth Asteroid Rendezvous space probe was renamed "NEAR Shoemaker" in his honor. It arrived at asteroid 433 Eros in February 2000, and landed on the asteroid after a year of orbital study. He was previously honored with the asteroid 2074 Shoemaker, discovered and named by his colleague, Eleanor F. Helin. See also: Category:Discoveries by Eugene Merle Shoemaker. Gene Shoemaker is credited by the Minor Planet Center with the co-discovery of 183 minor planets between 1977 and 1994. ^ Undoubtedly, she knew that the rural schools could not properly develop her son's intellectual prowess. ^ Buffalo Museum of Education likely refers to the institution now known as the Buffalo Museum of Science. ^ Astronomer and co-discoverer of the Shoemaker-Levy comet, David H. Levy, reportedly, said that Shoemaker had never considered going to any other university than Caltech. ^ Gene would maintain some association with the USGS for the rest of his active life. ^ Dr. Rahe was a German-American astronomer and project leader at NASA who was killed in an auto accident near Washington D. C. on June 18, 1997. ^ "Eugene M. Shoemaker Biography". www.bookrags.com. Retrieved March 31, 2018. ^ "- American Institute of Physics". www.aip.org. Retrieved March 31, 2018. ^ Levy, David H. (November 24, 2002). "Shoemaker by Levy - The Man Who Made an Impact". Princeton University Press. Retrieved March 31, 2018 – via Google Books. ^ "2011 March – Ahern Funeral Home Condolences". www.ahernfuneralhome.com. Retrieved March 31, 2018. ^ "History - SUNY Buffalo State". suny.buffalostate.edu. Retrieved March 31, 2018. ^ a b c d e f Kieffer, Susan. W. "Eugene M. Shoemaker (1928 - 1997)." Biographical Memoirs. National Academy of Sciences. 2015. Accessed April 22, 2017. ^ a b Chapman, Mary G. "Carolyn Shoemaker." USGS Astrogeology Center. May 17, 2002. Accessed April 24, 2017. ^ Phinney, William (2015). Science Training History of the Apollo Astronauts. NASA SP -2015-626. p. 65. ^ a b c Levy, David (2002). Shoemaker by Levy: The man who made an impact. Princeton: Princeton University Press. pp. 69, 74–75, 78–79, 81–85, 99–100. ISBN 9780691113258. ^ "About - USGS Astrogeology Science Center". astrogeology.usgs.gov. Retrieved March 31, 2018. ^ Malcolm W. Browne, Dr. Eugene Shoemaker, 69; Set Record for Finding Comets, New York Times (July 19, 1997). ^ "BQR - winter 1999-2000 - Gene Shoemaker". www.gcrg.org. Retrieved March 31, 2018. ^ Dandj (December 26, 2010). "Travels with an Oka: In the Wheel Ruts of Len Beadell". dandjribbans.blogspot.com.au. Retrieved March 31, 2018. ^ "Astronomer Eugene Shoemaker dies in car crash". deseretnews.com. July 19, 1997. Retrieved March 31, 2018. ^ "Gene Shoemaker". The Economist. Retrieved March 31, 2018. ^ "Eugene Shoemaker (1928-1997)". www2.jpl.nasa.gov. Retrieved March 31, 2018. ^ "Eugene Shoemaker (1928 - 1997) - American Astronomical Society". aas.org. Retrieved March 31, 2018. ^ a b Porco, Carolyn. "The Eugene M. Shoemaker Tribute". Diamond Sky Productions. Retrieved June 8, 2013. ^ a b Porco, Carolyn C. (February 2000). "Destination Moon". Astronomy. Retrieved June 8, 2013. ^ "Fly Me to the Moon ... Forever". space.com. Retrieved March 31, 2018. ^ "Eugene Shoemaker Ashes Carried on Lunar Prospector". www2.jpl.nasa.gov. Retrieved March 31, 2018. ^ Chamberlin, Alan. "JPL Small-Body Database Browser". ssd.jpl.nasa.gov. Retrieved March 31, 2018. ^ "Minor Planet Discoverers (by number)". Minor Planet Center. October 25, 2018. Retrieved February 18, 2019. Smith, B. A.; Soderblom, L. A.; Beebe, A.; Bliss, D.; Boyce, J. M.; Brahic, A.; Briggs, G. A.; Brown, R. H.; Collins, S. A. (July 4, 1986). "Voyager 2 in the Uranian System: Imaging Science Results". Science. 233 (4759): 43–64. Bibcode:1986Sci...233...43S. doi:10.1126/science.233.4759.43. PMID 17812889.